Casting on knitting stitches creates a foundation row of stitches so that you can start knitting and there are many ways to do it. 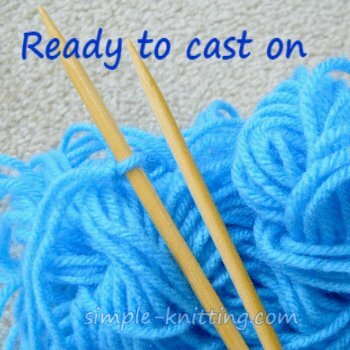 Once you have a slip knot on your needle, which is like an anchor for adding more knitting stitches you just have to choose a casting on knitting method you like and you're all set. There are lots of ways to put stitches on your needles and I'm going to show you the simplest and most popular knitting cast ons for now. Then you can choose which one you like. Later on as you continue learning to knit and building your knitting skills you may like to try other ways of casting on. Some cast on knitting methods are good all purpose methods to learn and can be used for most projects. In fact some knitters learn one way and use it always. Note: There are many great knitters who have created videos on YouTube. I have chosen only the best ones to help demonstrate these casting on knitting techniques. Of course there are some knitters that just prefer speed when they cast on so they may choose a quicker method to get those stitches on their knitting needle. Or which is the easiest? What matters the most is what you feel comfortable with and which one you like. Try them all and see what you think. OK are you ready to start? Once again these three cast on methods are quite simple to learn and excellent all purpose cast ons. This way is probably the easiest cast on method to learn. This one is the quickest but can be tricky to learn. It is fun though. Have a look. This method is the one I learned way back when. I like it and it's a nice alternative. Choosing a cast on knitting method is all about what you like so just experiment with these cast on methods and choose the one you like. Then when you have all the stitches you need on your needle you can learn the very first stitch the knit stitch. The knit stitch is my favorite stitch. I just love it! With just this one stitch you can create beautiful knitting treasures.